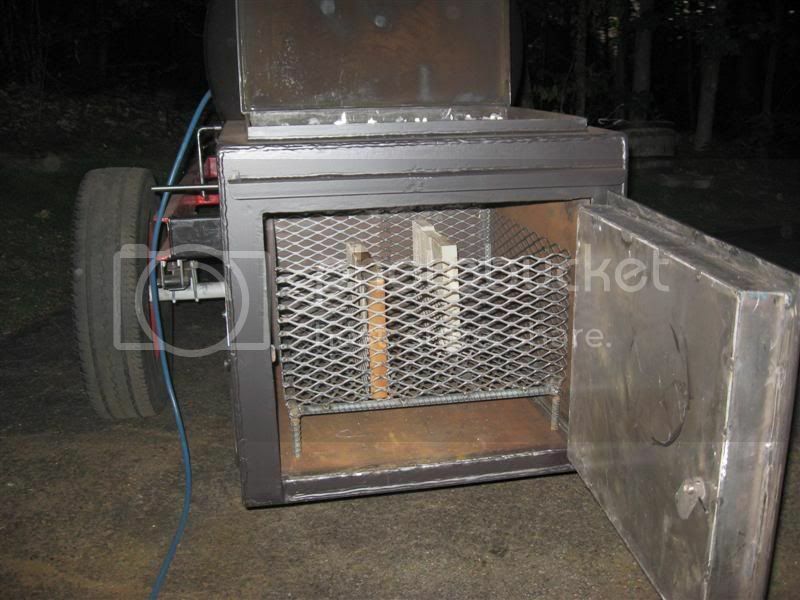 Well boys and gals, I finally made it through�I�ve finished insulating the fire box and put two coats of paint on the cooker, the frame has one coat of primer and one coat of fire red, this week I�ll finish building the countertop supports and will apply the last coats of paint. I couldn�t wait to try the cooker since the changes, so far �.GREAT RESULTS! The wife picked a 18 lbs whole fresh ham last week which since then I�ve had it in sugar/salt/pepper and spices brine. 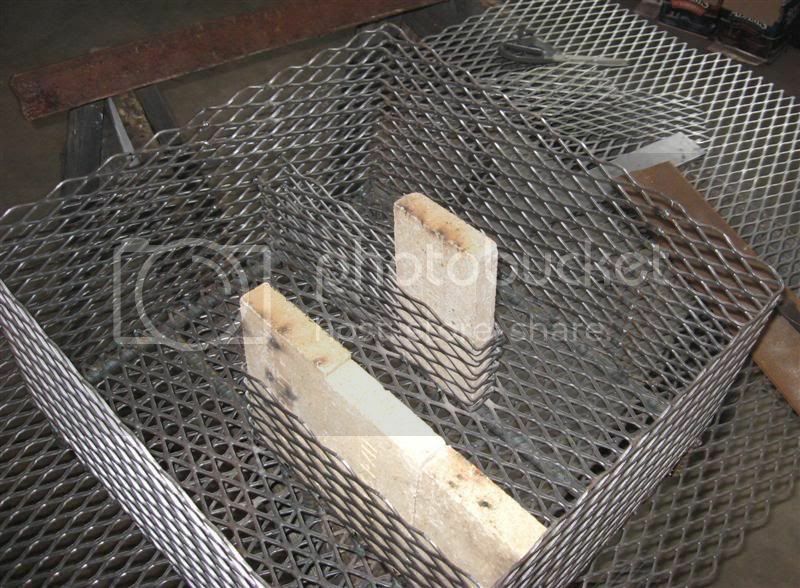 Using pieces of expanded metal, I made up this 21.5� x 21x 10� lump burning basket, the fire bricks are removable to cut back on its overall weight. Three inches of the bottom, and just enough room on top to fit arm size wood sticks. 21:00, lit up my home made chimney started and in no time I had it fired up. 21:20, the fresh ham went in the cooker at 200* ; at 00:48 (mother�s day) the temp gauge read 230*; at 02:30 it read 250* and at 03:40 it read 240*, at this time the meat temp was up to 150* �the temp kept creeping up on me so every hour or so I would open the door to vent out some heat. At any rate, I was not ready for a full overnighter so I decided to load up the basket with two full shovels of briquettes and went to bed for a nap, it was 4 in the morning. Either way just to be on the safe side, I put the meat in the oven set at 250* and removed when the internal temps reached 190*. I like the reverse flow and believe that when using the whole cooker the temps will be easier to maintain at around 225*, rather that 250*(not a bad thing)�remember I have a divider plate in the center of the cooker. 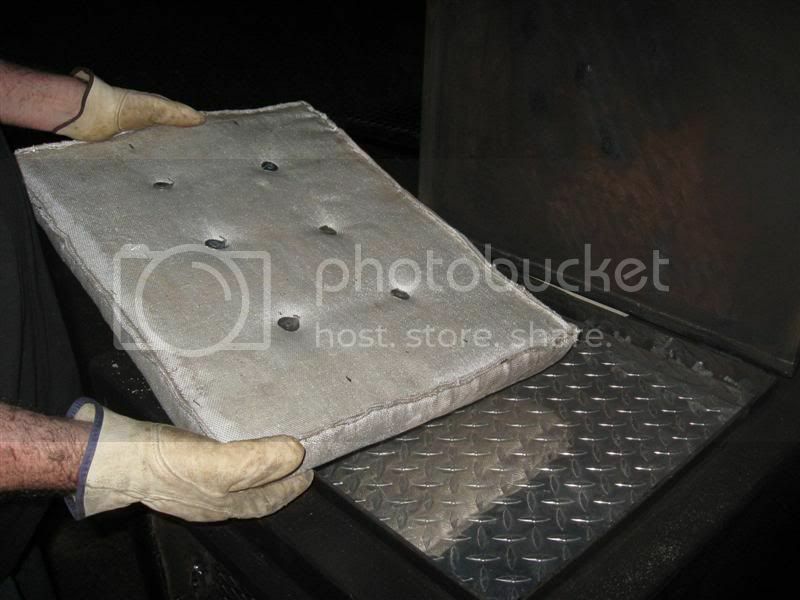 Also, I didn�t care to handle the pillow so I might modify the hatch and built in a permanent insulating box onto it, just like I did on the fire box door. 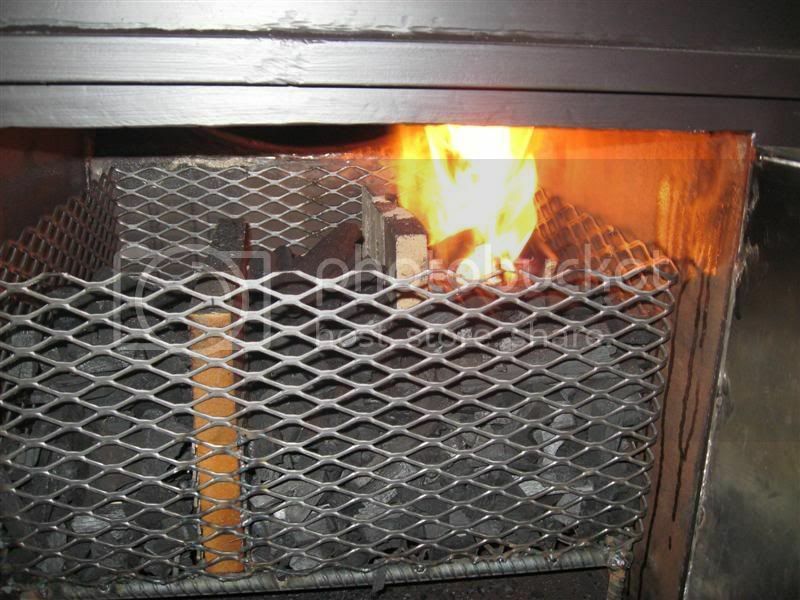 I�ll install gaskets on the firebox door jams in order to minimize air leaking in. 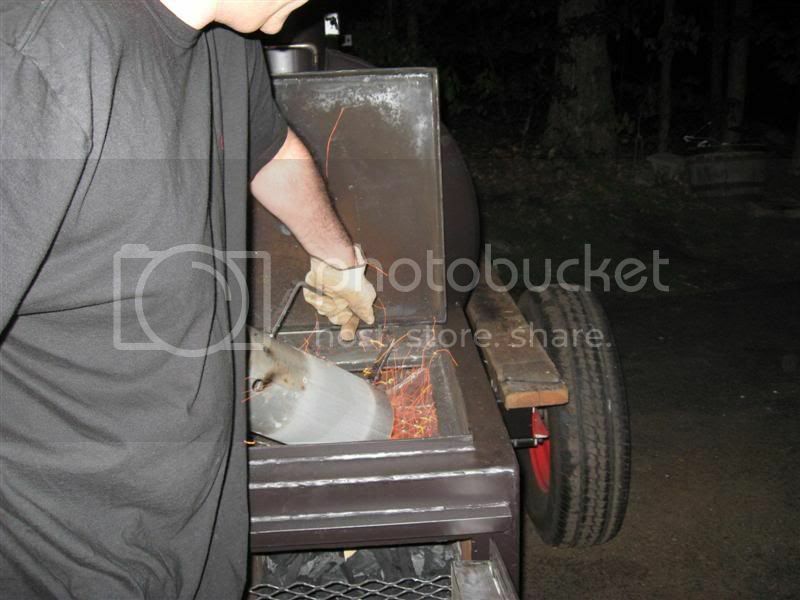 For the next cook out, I�ll start warming up the cooker all the way to 250* using sticks and then go with a full basket of lump and wood chunks, I might gain steadier temps plus longer burning time. Nice pillow. Do you think the bricks made a difference from your tests without bricks?� Did the alum. plate melt at all? 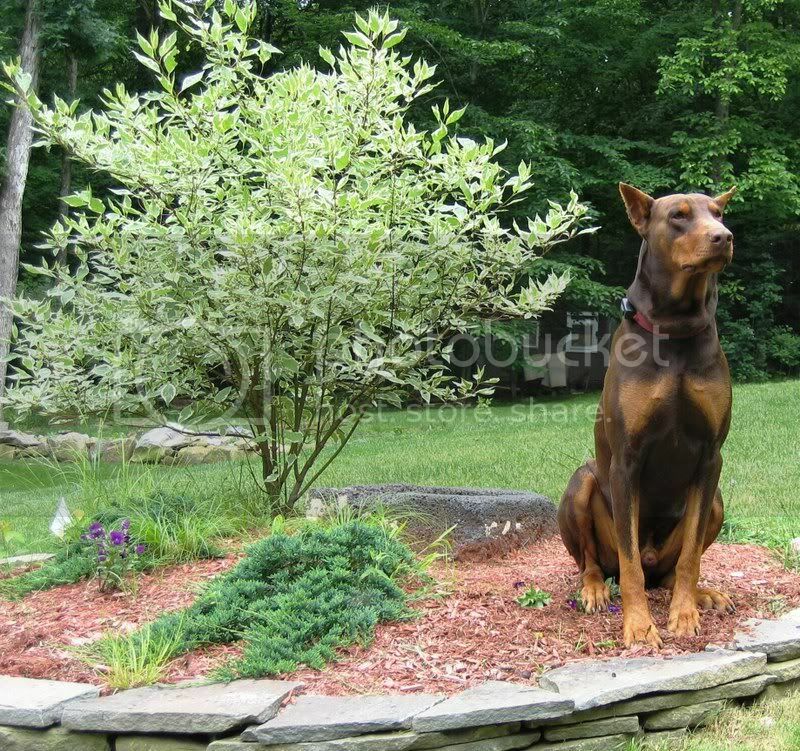 That Dobie ain't dumb he guards the thing that the goodies come out of Great write up and pics. Don�t worry too much about it. Just do all you can do and let the rough end drag. Wow Joe! I really like the basket idea! Great way to keep the weight down! 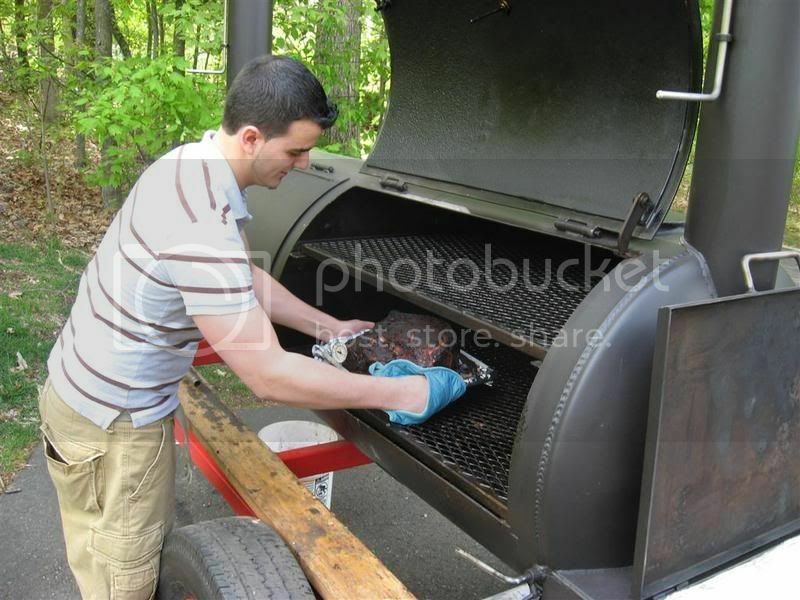 To keep the temps from creeping up as much try putting less charcoal in the middle section of the basket. It will burn a little faster but you shouldn't see the temp climb as much either. 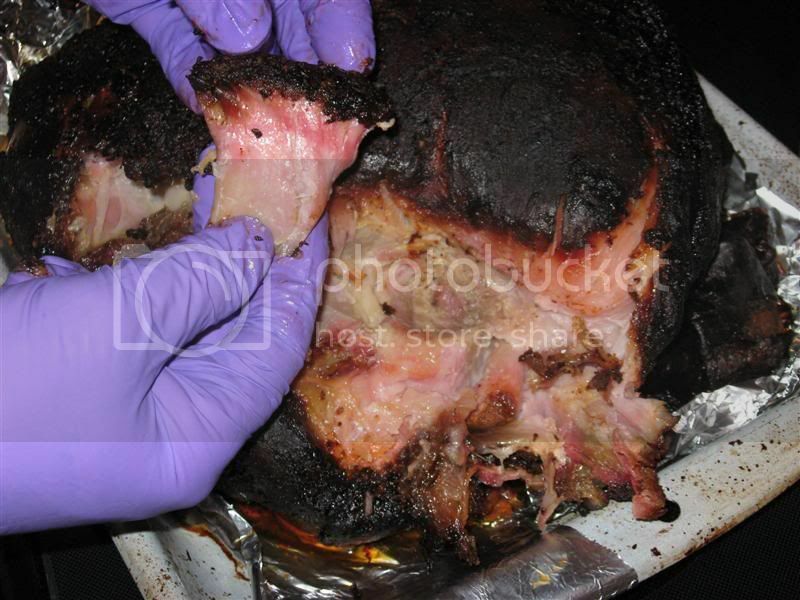 You�re really taking that smoker of yours to new levels of operation. Very impressive my friend! Good job Joe.You know it is amazing the ingenuity and intelligence of the forum people here. The quest for the perfect smoker! Great write up, I look forward to more info as you go along. Great skills, great looking puppie, great looking grub. Do you think the bricks made a difference from your tests without bricks?� Did the alum. plate melt at all? I assume you refer to the bricks in the basket...I didn't test w/out them, like I said, there's too much air leaking in the fire box allowing uncontrollable combustion which in this case I doubt if the bricks helped at all, however I hope to achieve better burning control by installing stove gaskets on the F/B door jams. The aluminium plate did not melt. I forgot to mention...during the cook out, the front half of the cooker temp ranged from 100* to 140*, openening and closing its chimney damper would vary those numbers. You know guys, I owe you all a lot... from everyone that has helped me with this project and everyone else that has shared info of home projects and great info from their experiences ...like they say "one picture is worth a thousand words"